Today I am going to talk about MST and stands for Multiple spanning tree protocol. The purpose of MST is basically providing the capabilities of rapid convergence and load balancing in a VLAN environment. As many of you studied about STP, RSTP, PVSTP and PVSTP+, the convergence time of MST is much faster than PVSTP+ and has compatibility with both PVSTP+ and RSTP LAN network design. MST permits to construct multiple spanning trees over trunks. We can group and associate VLANs to spanning tree instances. Every instance can have a topology self-determining of other spanning tree instances. This design offers multiple redirecting paths for data traffic and permits load balancing. Network error tolerance is enhanced because a catastrophe in one occurrence does not disturb other cases. Well talk about Spanning tree, A spanning tree instance can occur only on bridges that have well-matched VLAN occurrence allocations. We need to design a set of bridges with the same MST configuration data, which permits them to contribute in a precise set of spanning tree instances. Do not deactivate spanning tree on any VLAN in any of the PVST bridges. Do no use PVST bridges as the root of CST. Do not connect switches with access links since access links may partition a VLAN. Ensure that all PVST root bridges have lower, priority than the CST root bridge. Ensure that trunks carry all of the VLANs mapped to an instance or do not carry any VLANs at all for this instance. RouteXP_SW (config)# spanning-tree mst 1 priority? 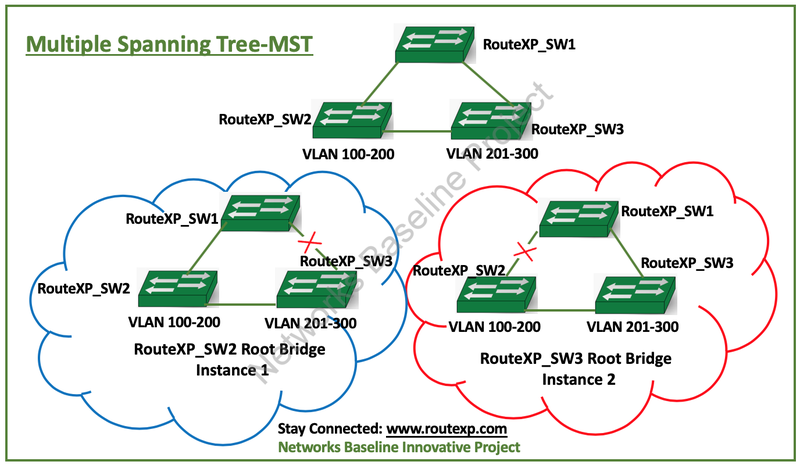 RouteXP_SW (config-if) # spanning-tree mst 1?